The Kitlanya West Project (KIT-W) consists of licenses 342/2016 and 343/2016 located on the northern margin of the Kalahari Copper Belt adjacent to the Ngami Copper Project. 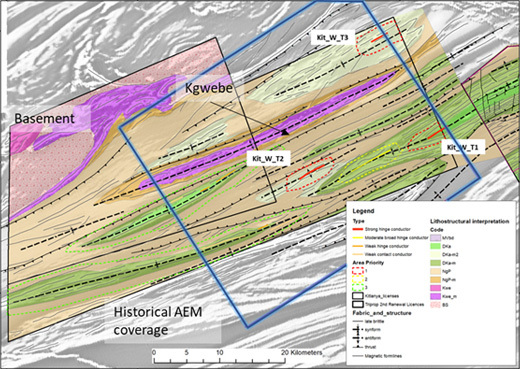 The position of the project on the margin of the basin with further evidence in magnetic data of Kgwebe Formation basement in an anticline core is considered ideal for sedimentary copper deposits. Interpretation of magnetic data highlights several prospective fold structures for follow-up. 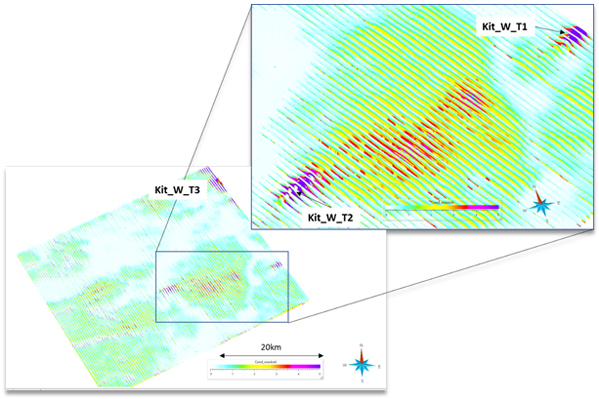 Inversion work carried out on historical AEM data has highlighted three compelling ‘dome’ targets located in fold hinge zones identified in the magnetic data. Interpretation of regional magnetic data with priority AEM targets overlain. 3D view illustrating the results from inversion of historical AEM data with ‘dome’ targets highlighted.